Cadillac has inked a three-year partnership deal with the PGA that includes media buys on CBS and ESPN, which will televise future tournaments. The General Motors luxury division was named the official vehicle of the PGA of America, PGA Championship, KitchenAid Senior PGA Championship and KPMG Women’s PGA Championship. The partnership was announced in conjunction with the opening day of the 2019 PGA Merchandise Show at the Orange County Convention Center in Orlando, Fla., where two Cadillac vehicles are currently on exhibit. 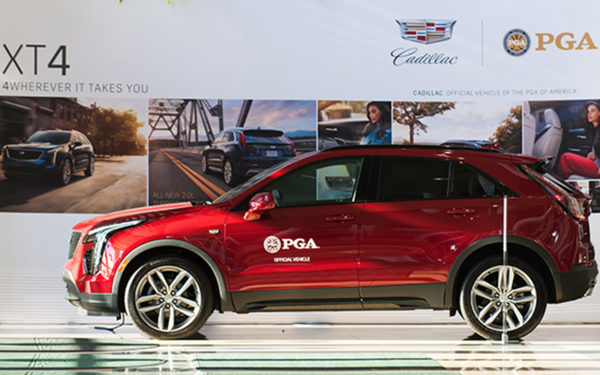 The partnership includes onsite activation rights and hospitality for Cadillac at these major championships. Vehicle fleets will also be provided for players, while Cadillacs will also be on display at each of the Championship Shops for spectators. Cadillac will also serve as a partner for the KPMG Women's Leadership Summit, which brings together leaders in business, politics, sports and the media. The partnership will enable Cadillac to reach and engage a diverse demographic with multiple large-scale touch points each year, says Cadillac CMO Deborah Wahl. The automaker is introducing a new vehicle every six months for the next three years, and partnering with the PGA of America provides a platform to showcase the brand’s expanding portfolio, she adds. Cadillac relinquished its sponsorship of The Masters in 2007 after 40 years, then returned in 2010 as the title sponsor of the World Golf Championships-Cadillac Championship. That agreement, however, was terminated in 2016 due to then-presidential candidate Donald Trump’s ownership of Trump National Doral in Miami and controversial comments made during his campaign, according to thesports.biz. The automaker has been the official vehicle at the PGA Wyndham Championship in Greensboro, N.C., most recently in 2018. Other major PGA sponsors include Farmers Insurance, FedEx, Charles Schwab, Michelob Ultra and Mercedes-Benz. A Mercedes-Benz spokesperson said the German automaker would continue to sponsor The Masters. Golf is an $84 billion industry in the U.S., with 31 million people participating in the sport in 2018, PGA of America President Suzy Whaley told the Golf Channel Wednesday morning at the PGA Merchandise Show. About 2.6 million were new golfers and 35% were women, she says.